For many, the process of writing a CV is the first thing they do when looking for a role – whether they are looking for a board role or an executive one. When compiling a Board CV guidelines on how to go about it can help you dare them not to appoint you. I find that many put too much stock in having a good CV. Don’t get me wrong, a good CV is critical in your Board appointment journey, but it should not be solely relied on or considered the be all and end all. 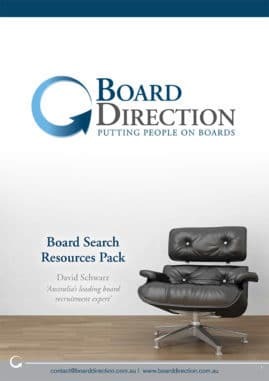 Once you know what it is you offer a board, what Chairs want to see in successful candidates and how the majority of board appointments are made, you should see your Board CV as a complementary resource that will reinforce in the mind of an appointing organisation that you are a strong candidate. The most important guideline I can probably give you, is that your Board CV should strongly differentiate you from your competitors and dare them not to interview you. How does a Board CV differ from an Executive CV? It told me that they were not entirely serious about gaining the board appointment – or at least less serious than their competitors who had gone to the trouble of writing a dedicated board CV. It told me that they had not given proper consideration to how being an executive differed from being a non-executive. Both these elements adversely affected my ability to grade them positively or recommend them wholeheartedly to my client. An Executive CV is tailored to an executive role. At a macro level, it is crafted to gain an executive role and will use the language, aspirations and referees required to do that. The executive CV focuses on the executive duties required in the role rather than the more strategic elements required at board level. Additionally, the successes that might be included in an executive CV, will highlight your ability to achieve success as an individual rather than an individual as part of a board. You must ensure that all your board documents are readable. If they are not readable then they are unlikely to be read. Even if you include strong and clear successes within the document, there is a chance that they will be overlooked because it is too hard to find. When it comes to Board CV guidelines, the most important aspect I want you to focus on is to be clear and articulate what you have achieved – at board level or at the very least in a strategic manner. Board CV Guidelines: Should I include a photo? The quality of a picture on a CV cannot be guaranteed when it is printed – and they often are. This might mean that your crisp, clean and professional image ends up being smudged, faded or half printed and leaves you looking like a monster. You cannot foresee how the reader of your CV will view you. Everybody will read your CV with some preconceptions – remember the Fundamental Attribution Error! In fact, a recruiter once told me that ‘everyone recruits in their own image’. Likewise, your picture might remind them of someone they know – an ex-wife or -husband (who they don’t like), their son or daughter (too young and inexperienced for the role) or their mother or father (too old for the role). There have been some studies conducted that show that too much time is spent looking at the picture on a CV rather than reading it. So, in my experience, and for these reasons, I think it is just better to not include your picture at all. Board CV Guidelines: Should I include my address? I do encourage you to include your address. For many organisations, they are interested in local candidates; not including your address might suggest that you are not local and this can affect your chances of gaining an interview. You needn’t put in your full address if you don’t want to. However, I do recommend at the very least you name the city and/or suburb you reside in. I never recommend you reduce the size of the font you use to be anything less than 11pt – doing so will render your CV less readable and therefore less read. Use Helvetica as the font for your CV. Research that suggested that this is the ONLY font to use on a CV – again for readability reasons. Many people begin their CV with the words CV or Resume at the top. You needn’t do this, as the reader is plainly aware that this is a CV – removing this text helps the document to be more readable. Again, remember that your Board CV is not the same as an executive CV. The reader (often the Chair) is not interested in how many people you managed or the detail of your day job. Instead, they are going to want to know how you can operate on, and contribute to, the board. It is therefore important to focus on these elements in your document. Board CV guidelines can help you write your own. 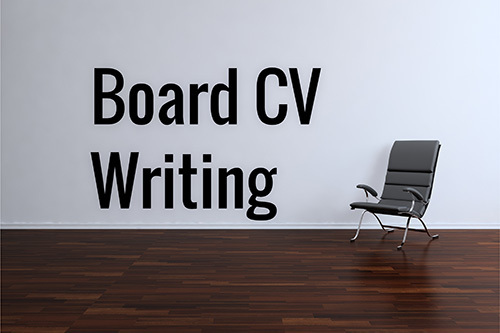 However, to give you the best chance to dare them not to appoint you, let us create a bespoke Board CV for you that addresses the five things Chairs look for in every prospective board candidate.